All asphalts used in the United States are products of the distillation of crude petroleum. Asphalt is produced in a variety of types and grades ranging from hard and brittle solids to almost water-thin liquids. Asphalt cement is the basis of all of these products. It can be made fluid for spraying from an asphalt distributor by heating, by adding a solvent, or by emulsifying it. When a petroleum solvent, such as naphtha or kerosene, is added to the base asphalt to make it fluid, the product is called a cutback asphalt. When asphalt is broken into minute particles and dispersed in water with an emulsifier, it becomes an emulsified asphalt. The tiny droplets of asphalt remain dispersed until the emulsified asphalt breaks. All three of these forms (asphalt cement, cutbacks, and emulsions) may be used for seal coat and surface treatment work. However, the use of cutback asphalts has declined rapidly over the years due to concerns over air pollution and potential health risks as the solvents evaporate into the atmosphere. When applied, the binder should be fluid enough to spray and cover the surface uniformly, yet viscous enough to remain in a uniform layer and not puddle in depressions or run off the pavement. After application, it should retain the required consistency to wet the applied aggregate. It should develop adhesion quickly. After rolling and curing, the binder should hold the aggregate tightly to the roadway surface to prevent dislodging by traffic. When applied in the proper amount, it should not bleed or strip under traffic or with changing weather conditions. The bituminous binders used for seal coats and surface treatments should conform to TxDOT Standard Specification Item 300, Asphalts, Oils, and Emulsions. Table 3-1 from Item 300 shows typical uses for different types of bituminous binders. Asphalt cements are classified based on their viscosity in poises (centimeter-gram-second units of dynamic viscosity) at 140°F. For example, if AC-5 or AC-10 is specified, the numerical value in these designations indicates the viscosity in hundreds of poises at 140°F. Additional letter designations such as “P” or “TR” as in AC-15P or AC-20-5TR indicate the presence of a polymer or (5 percent) tire rubber, respectively. There are many requirements in the specifications for asphalt cements. The most important requirements are the viscosity, penetration, and aged viscosity. With these requirements we attempt to control the temperature susceptibility (change of viscosity with change in temperature) of the asphalt and limit the amount of aging expected through the hot mix plant. We do not want an asphalt that gets too viscous at low temperatures or gets too fluid at high temperatures. We also don’t want an asphalt which ages quickly in the hot mix plant. Although asphalt cements used for seal coats and surface treatments are not processed through a hot mix asphalt concrete plant, some test requirements were developed to consider the aging that occurs through the hot mix asphalt concrete plant. The main tests performed for asphalt cement and the reasoning behind them follow. Viscosity. Viscosity is defined as a fluid’s resistance to flow. The viscosity test is conducted at two temperatures, 140°F and 275°F. This test indicates how viscous the binder is at approximate maximum road temperatures (140°F) and its relative resistance to deformation (rutting) at summertime road temperatures. The limits on the high-temperature viscosity help ensure the asphalt does not get too fluid at high temperatures. An example of what to avoid is an asphalt that behaves like a wax. A wax will be stiff and hard at low temperatures, but as the temperature is raised, will soften and lose its stiffness. At 140°F, there is a minimum and maximum viscosity required. At 275°F, there is only a minimum viscosity required. Penetration. The standard penetration test indicates the relative stiffness of the asphalt at a temperature of 77°F. The test measures the distance a standard needle weighted with a mass of 100 grams penetrates into the asphalt in 5 seconds. All testing takes place at a controlled temperature of 77°F. The specification places a minimum on the penetration. The further the needle penetrates into the asphalt, the softer the asphalt. Flash Point. The flash point is defined as the lowest temperature at which application of a test flame causes the vapors above the surface of the liquid to ignite. This test is conducted for safety reasons. The test performed is the Cleveland Open Cup Flash Point as described in AASHTO Test Method T-48. An open cup of asphalt is heated at a specified rate. At temperature intervals, a small gas flame is passed over the surface of the asphalt. A minimum flash temperature is required for each type of asphalt cement. Solubility in Trichloroethylene (TCE). In this test (AASHTO T-44), asphalt is dissolved in TCE and filtered. The insoluble material is weighed. This test places maximum limits on inorganic materials or carbon residues in the asphalt. These materials, if present, add no binding quality to the asphalt and are considered contaminants. Spot Test. To conduct the spot test (Tex-509-C), a small amount of asphalt is dissolved in a solvent and dotted on a filter paper. A positive spot is seen as a ring of dark material deposited as the solvent-asphalt blend is absorbed and spreads out on the filter paper. This test is used to screen asphalts that age excessively in the Thin Film Oven Test (TFOT). Item 300 requires a negative result for the spot test. A positive spot indicates overheating during the manufacturing process. Specific Gravity. Specific gravity is not a specification requirement but is a test performed to allow temperature-volume conversions in the field to ensure proper application rates. Specific gravity is the ratio of the mass of a given volume of material at 77°F to that of an equal volume of water at the same temperature. Thin Film Oven Test. The Thin Film Oven Test (TFOT) is an aging test. This aging simulates the aging expected in the hot mix asphalt concrete plant. Viscosity of TFOT Residue. The viscosity of the TFOT residue is measured to limit the aging of the selected asphalt to a threefold increase over the midpoint of the grade range at 140°F. As an example, AC-10 has a limit of 3 x 1000 = 3000 poise. Ductility of TFOT Residue. The TFOT residue is subjected to a ductility test. A dog bone-shaped specimen is cast and pulled apart at a standard speed and temperature in a water bath. The distance to rupture is measured. This test provides an empirical measure of the cohesiveness of the asphalt after aging. It is another limit on the stiffness of the asphalt after aging. allow application at lower binder temperatures. The solvent functions as a carrier or application facilitator. After the application, the solvent evaporates leaving the asphalt cement. In this respect, the use of cutback asphalt is a poor use of solvents that could be used as fuels and these solvents may contribute to air pollution. For these reasons, TxDOT has continued to reduce the amount of cutback asphalt used in construction and maintenance operations. There are two general types of cutback asphalt used by TxDOT: rapid curing (RC) and medium curing (MC). Rapid curing cutbacks contain a solvent in the gasoline-naphtha boiling range. Medium curing cutbacks contain a solvent in the kerosene boiling range. Since gasoline-naphtha is more volatile than kerosene, the solvent in rapid curing cutbacks evaporates faster than the solvent in medium curing cutbacks. Heating asphalt binder always constitutes some degree of hazard. The most hazardous are cutback asphalts because of the highly volatile solvents used. Extreme care must be taken not to allow any spark or open flame to come in contact with the cutback asphalt or the gases from cutback asphalt due to the low flash point. 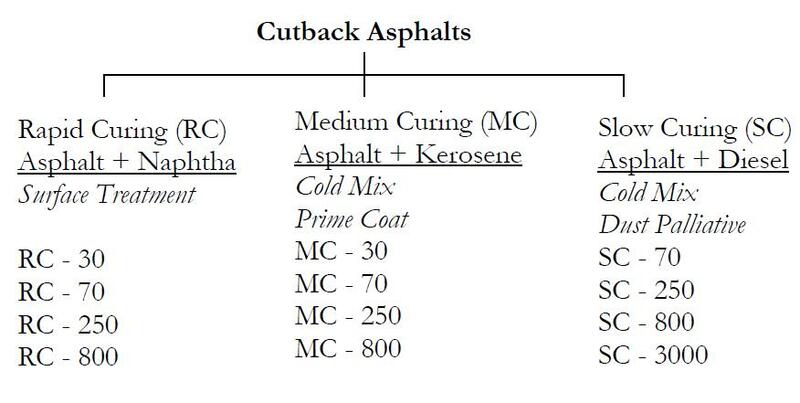 As in asphalt cements, rapid and medium curing cutbacks have a nomenclature that describes their solvent and viscosity. A cutback is designated as either RC (rapid curing) or MC (medium curing) to describe the solvent and a number from 30 to 3000 to describe the viscosity. The lower the number, the more solvent is contained in the product. MC-30 contains approximately 35 to 40 percent solvent while an MC-3000 contains only about 5 percent solvent. RC cutbacks are primarily used for surface treatments on base courses and tack coats. MC cutbacks are primarily used for prime coats and surface treatments on base courses. The specification requirements for cutback asphalt focus on determining the type and amount of solvent used and the stiffness of the asphalt cement in the cutback. Viscosity. The viscosity of the cutback is determined to ensure that the viscosity is in the range required by the specification. Viscosity of the cutback is critical to successful application. For instance, MC-30 is used for priming road base. The viscosity must be low enough that the cutback will penetrate (soak into) the base material. It must form a waterproof layer and enable successive asphalt layers to adhere to the base. Each grade of both MCs and RCs has its own viscosity limits. Flash Point. Flash point is a safety related test. The procedure is similar to that of the asphalt cement. The container geometry is slightly different, but the result is the same. It provides an idea of the temperature at which one can expect the material to generate fumes that could ignite. to examine the characteristics of the residue. In the test, a sample of cutback asphalt is heated to 680°F. The initial boiling point and the amount of solvent collected at specified temperatures are measured. At 680°F, the remaining asphalt is removed from the heat source and poured into a can for further testing. Specific Gravity. Specific gravity is not a specification requirement but is measured to allow for temperature-volume corrections in the field. Penetration/Ductility. These tests are performed on the residue obtained from distillation. They are indicators of the stiffness and cohesiveness of the asphalt residue. They are performed using the same procedures described in the Asphalt Cement section. Recommended for use with pre-coated aggregate. TXDOT specified product application temperatures 300° F to 375° F. Recommended 350° F to 375° F.
Designed for very quick application and return to traffic. Product “thickens” and creates a “bond” with aggregate quickly as it cools. Hot Applied products are designed for efficient quick applications and leave very little room for mistakes. Emulsified asphalt consists of asphalt cement droplets suspended in water (Figure 3-1). This dispersion, under normal circumstances, would not take place, since oil and water do not mix. If an emulsifying agent is added to the water, the asphalt cement will remain dispersed. 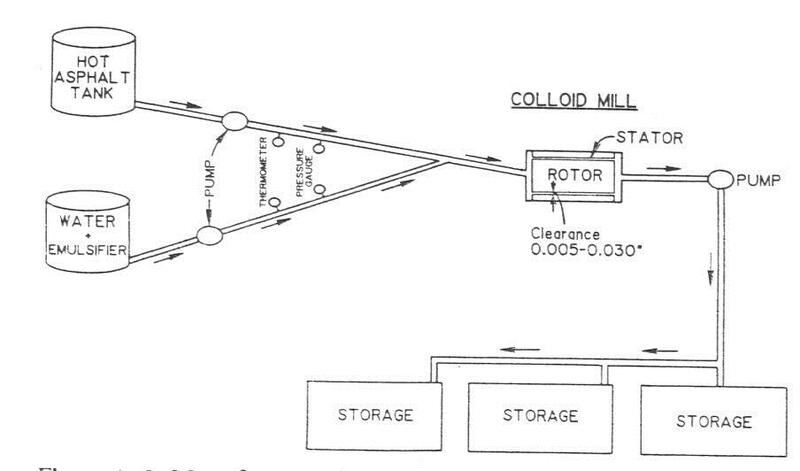 In the production of asphalt emulsion, water is mixed with an emulsifying agent and is pumped to a colloid mill along with asphalt (Figure 3-2). The colloid mill breaks the asphalt up into tiny droplets less than 5 microns in diameter. The emulsifying agent migrates to the asphalt-water interface and keeps the droplets from coalescing, because the asphalt droplets all carry the same electric charge. The emulsion is then pumped to a storage tank. Figure 3-1. 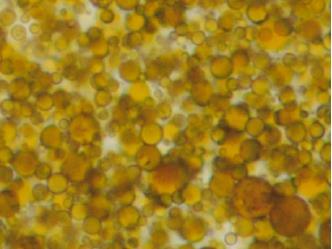 Greatly magnified image of emulsified asphalt. Emulsions are produced for ease of application. Emulsions enable much lower application temperatures to be used. Application temperatures range from 120°F to 160°F. This is much lower than the 275°F to 350°F used for asphalt cements. The lower application temperatures will not damage the asphalt and are much safer for field personnel. Figure 3-2. Manufacture of emulsified asphalt. After emulsion and aggregate have been applied to the road surface, the emulsion “breaks” leaving the asphalt cement holding the aggregate. The rate at which the asphalt globules separate from the water phase is referred to as the “breaking” or “setting” time. The rate of breaking is controlled primarily by the specific type and concentration of the emulsifying agent used, as well as atmospheric conditions. The fact that different aggregate types have different rates of absorption means that breaking is also related to the relative absorption characteristics of the aggregate used. Those with higher absorption rates tend to accelerate the breaking of the emulsion due to the more rapid removal of water. intensity of charge on aggregate versus intensity of emulsifier charge. Asphalt emulsions are divided into three categories: anionic, cationic, and non-ionic. In practice, only the first two are used for surface treatments and seal coats. The anionic and cationic classes refer to the electrical charges surrounding the asphalt particles. 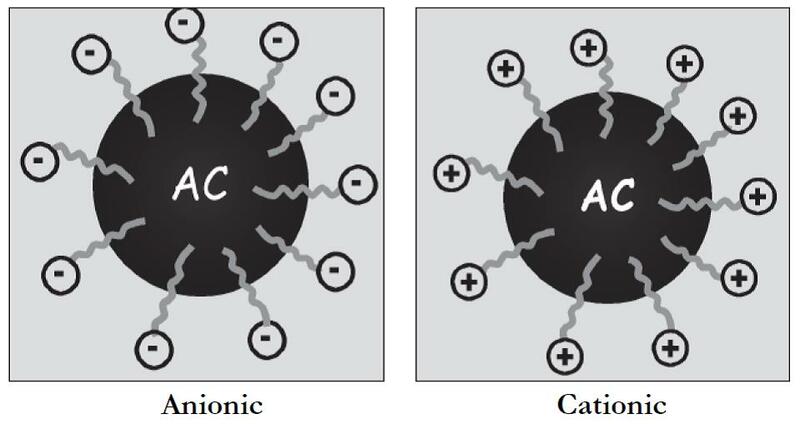 Cationic emulsions have a positive (+) electrical charge and anionic emulsions have a negative (-) electrical charge. Aggregates for use with emulsions should not be precoated because the precoating inhibits the chemical break, absorption, and adhesion of the emulsion to the rock. In general, cationic emulsions will break and set more quickly than anionic emulsions. In high humidity or cooler weather, cationic emulsions can break and set more quickly than anionic emulsions due to the electrochemical reaction between the aggregate and the binder in addition to evaporation of the water. Anionic emulsions tend to work well in low humidity or warm weather conditions. Figure 3-3. Basic emulsion types. Emulsions are named to describe their type, speed of break, and viscosity. A designation of “C” is used for cationic emulsions. Emulsions not using a “C” are anionic. Speed of break is designated by “RS” for rapid set, “MS” for medium set, and “SS” for slow set. The residue viscosity is designated by a number, usually a “1” or “2.” The “1” is a low viscosity emulsion used for such applications as fog sealing or cold weather applications where we want the emulsion to flow into cracks and crevices. The “2” is a high viscosity emulsion used for such applications as seal coats and surface treatments. If the number is followed by the letter “H,” the emulsion has a harder base asphalt. If the number is followed by the letter “P,” the emulsified asphalt contains a polymer. For example, CRS-2P is a cationic, rapid setting, high viscosity emulsion with polymer. High-float (HF) emulsions, such as HFRS, have a quality that permits a thicker asphalt film on the aggregate particles and prevents drain-off of asphalt from the high points of the road surface. To enhance flexibility over time. Tests for asphalt emulsions are devised to measure the emulsion properties, since these are the properties needed for handling and breaking, and the residual asphalt properties, since these will be the properties of the asphalt after break. Viscosity. The viscosity of the emulsion is measured to determine uniformity and conformance to application needs. In the test a sample is brought to the test temperature (77°F or 122°F) and poured into the Saybolt viscometer. The flow of emulsion through an orifice into a flask of known volume is timed. When the flask is filled, the number of seconds is recorded and checked against specifications. Sieve Test. This test measures the amount of foreign material or unemulsified asphalt in the emulsion. These materials can clog nozzles in a distributor truck and result in non-uniform application. A sample of emulsion is poured through a screen with specific opening sizes. Material retained on the screen is measured and expressed as a percent of the original emulsion. Demulsibility. This test measures the stability of the emulsion (resistance to break) and distinguishes between RS, MS, and SS types. In the test a known amount of chemical (Calcium Chloride for anionic emulsions and Sodium Dioctyl Sulfosuccinate for cationic emulsions) is added to a specific amount of emulsion. The amount of emulsion that breaks is measured and reported as a percent of the amount of asphalt in the emulsion. Distillation. In this test we measure the amount of asphalt in the emulsion and secure a sample of the residual asphalt for further testing. A known amount of emulsion is heated in a still to either 350°F or 500°F, depending on the requirements of each material. This heating drives off the water. The remaining asphalt is weighed to determine the asphalt content of the emulsion. The residual asphalt is poured into molds (penetration, ductility, or float) for further testing. Penetration. The penetration of the residual asphalt is measured to determine stiffness. The procedure is identical to that of asphalt cements. Ductility. The ductility of the residual asphalt is measured to determine cohesiveness. Polymer-modified emulsions will get a low-temperature ductility measurement. The test procedure is identical to that for asphalt cement. Float Test. The float test is a measure of the stiffness of the residual asphalt, but it is specifically designed to show the gel structure in a high float emulsion residue. A thimble-shaped mold with no top or bottom is filled with molten asphalt and allowed to cool. This mold is attached to a funnel-shaped float with the filled thimble plugging the hole in the funnel. This whole setup is floated in a 140°F water bath until the asphalt flows from the thimble and the float apparatus sinks. The number of seconds until sinking is reported. uncertain weather in conjunction with varying temperature and/or humidity.